Morning Blog friends. Today's theme in Scribble Picnic is SPICY. I went straight to peppers with this theme. 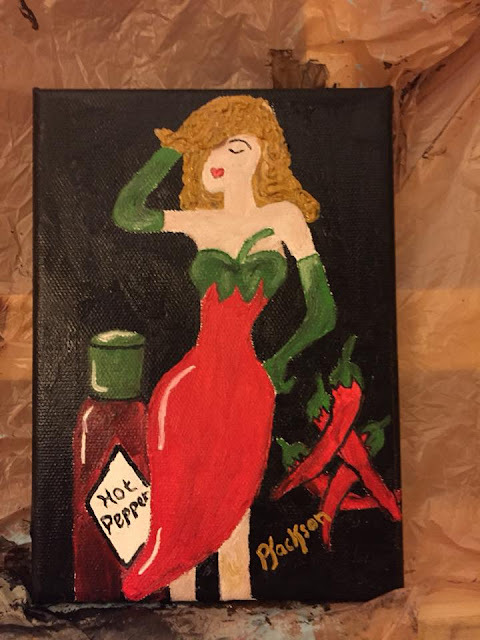 Oil painting of spicy food and spicy woman! Jump over and check out some neat artwork. 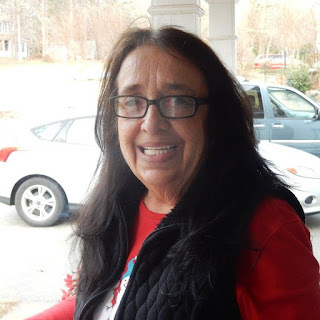 Yesterday my aunt, my mom's youngest sister turned 64. Hoping she had a great day. Yep...13 bucks for your dog to chew up. Dakota would have a hole in that in a matter of mins. Cute....this is for the pets food. Looks like a Mason jar. These are the two newest horses at the barn. Scout and FedEx. Scout is the black and white. So pretty. This is my friend Tim's baby. Stealing From Sandra and the H and J! I threw this together the other day. 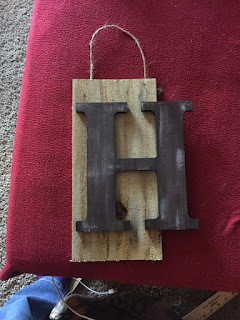 My daughter is getting married in April and will be taking the name Howell when she does. They recently moved and needed something for the front door. I had made this one about a yr ago and gave it to Amber. But with the wedding/ name change thingy coming up she gave this one back to me. It hangs on my front door right now. Which reminds me that I need to hang my Valentine one up on the door. Will do that later today. This morning I am picking up a friend that I have known since high school, he is having a skin graph today on some burns that he got a couple weeks ago. He was cooking hash browns on the stove, left the room for a few mins to come back to a flame. Grabbing the skillet and running to the front door. Burning his hand and thigh really bad. Mrs. Bettye Mossack the mother of a classmate. 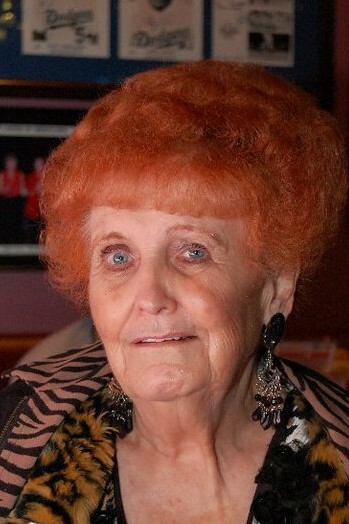 Mrs. Mossack left this world the other day. Two friends and I went out to the funeral home to be with Pam, her daughter for visitation. Well this is after I left...I mean I lost 70 lbs! Some came from the face.... and that chin! My journey started just at a yr ago. I weighed in at 210, lost 11 before surgery. On Feb 18 I had the gastric bypass and dropped the rest. Another 15 to 20 lbs and I will be happy. Meet Scout. 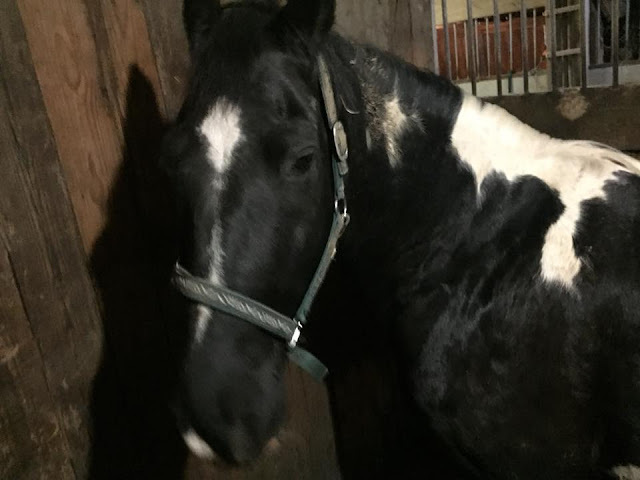 He is one of the new horses at the barn. He is just plain BEAUTIFUL! Black but he has those amazing white spots. Him and FedEx are still getting used to their new home and still learning me. I love it when they stop to smell me, like they are taking my scent in. This morning I am on the deck with Lily and Dakota. Lily is across the deck watching for squirrels and birds. and Dakota is trying to stay warm curled up under the throw next to his mom. I had my coffee inside earlier this morning and took my oatmeal out to the deck. I have been up to just about NOTHING when it comes to crafting/painting but I have had two really good days (upping meds must have helped) and I have been cleaning, sorting, moving things around in the 2nd guest room. Seriously, no pics but take my word for it...you could not walk in there. So since I am not showing those pics and I have not been doing anything creative or been out to do anything fun...I surffed PINTEREST for a blog idea. 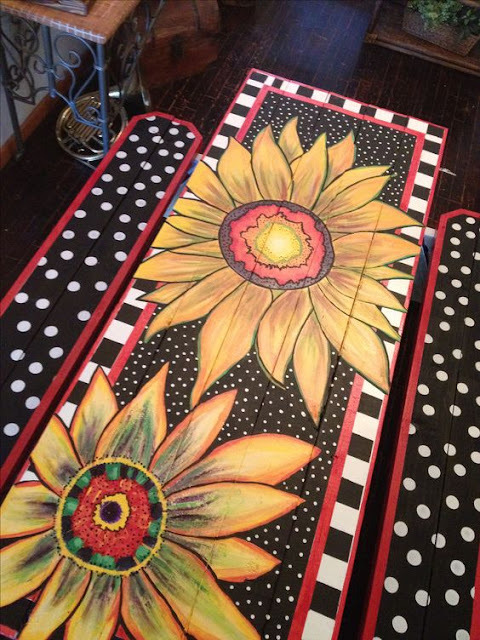 Check out these cute ideas for picnic tables. My mom is the type of person that don't like this sort of stuff, I on the other hand loves this stuff... and yes, have no issues doing something like this in my yard. Lots of work in the above pic..
Not as much work in the below pic. Cute, simple and does not jump out at you as much as the first one. This one is just so adorable (below) esp if you like watermelon!